Introducing Easy Life, the five-piece, multi-instrumental band from Leicester, England. Each band member carries several genres that influence their blended, unconventional sound including reggae, jazz, and hip hop. 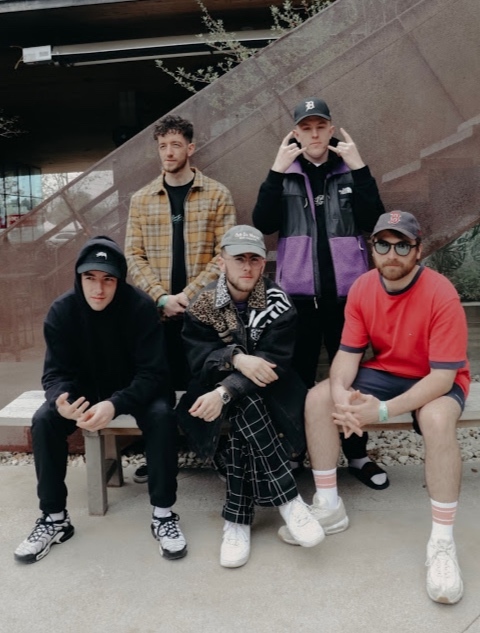 This being the band’s first time touring in the United States, Easy Life is covering some sacred ground at Coachella, Governors Ball, and Hangout Festival this year. I caught up with the band at SXSW on the iconic street of South Congress in Austin, Texas about their obsession with Texas culture and some of the bandmates’ quirks. ET: I loved seeing you guys perform the other night. What did you all do last night? Murray: We tried Terry Black’s Barbeque. Our first Barbecue experience. Next level. ET: Does barbeque exist in the UK? Murray: No. Not the same as Texas level. We went to a ranch as well and learned country songs. We rode horses and dressed up as cowboys at this place called Lone Star Ranch. ET: Murray, you grew up on a farm right? So not too far off. How did you make the transition from farm life to the city life? Murray: I still live on the farm actually. I have loads of space and can make loads of noise with no neighbors. I got a drum kit and just play a lot. ET: When did you all form the band? Ollie: Sam and Murray started Easy Life together, and they needed musicians. They grew up together, and so did me and Lew. The first time I met Murray properly, we almost lit the house on fire. We just wanted to create a band together. I also used to work for Jordan’s old band as a technician. On a night out with Murray, we asked Jordan to join the band. The next day we added another member, and we were like we need to stop adding so many members. Sam: Even with five of us, we’re like a big family. ET: What’s something you all want your listeners to know about you that they don’t know about you? Lewis: That is a good question. We’ve never been asked that. Like a secret? Lewis: We all have our hidden talents. Murray: I can get my legs over my head at the same time. Sam: We can all play drums. Lewis: We have loads of bad jokes that we find hilarious, but nobody else does. Sam: Well what people don’t know is now that we’ve been to Austin, we are writing a country album. Ollie: The only music we have been listening to the past five days has been the same few country songs. Ollie: All My Exes Live in Texas, Chicken Fried. Do you know Zac Brown Band?! EL: A little bit of Chicken Fried. Cold Beer on a Friday Night! Jordan: Amos Moses is another one. Amos Moses was a Cajun. He lived down in a swamp. Big tune. Murray: Wagon Wheel! Rock me mama like a wagon wheel. Rock me mama any way you feel. EL: (sings) I’m a country boy. Got a four-wheel drive. Jordan: Josh Turner “Put some music on that’s soft and slow.” I dream about it. ET: Wait how did you find all of these songs? Ollie: I used to be in a country band! Jordan: It is true! We’ve all been into different types of bands. Jordan was in a reggae band and Ollie was in a country band. ET: Y’all have to go to this country bar in Austin, called The White Horse. We can teach you how to two-step dance. Murray: Do they have open mic? I’d slay Wagon Wheel on the acoustic guitar. I can two-step and line dance as well. ET: Your music blends a lot of different styles and genres. What inspires your sound? Sam: It could be a song or sound we have heard. It kind of comes out of nowhere. There’s no real system for how it comes together. Lewis: I feel like I get kind of bored of one type sound. I never listen to the same thing. ET: What about the theme of lemons incorporated in your visuals and lyrics? Murray: The lemons thing fell into our lap. In ‘Nightmares,’ we say lemons in the song. Life gives you lemons. People have gone made for it, and we don’t know why. We encourage them though. Sam: For some stupid reason, we’ve told people to throw lemons at us on stage as well. Murray: No this was you! You told everyone to bring lemons to the show. Now people are like we’re going to throw lemons at you and you have to catch them. ET: We’ll bring lemons at the show tonight. Sam: If you hit Murray, you get 500 points. Murray: This is why we elaborate on lemons in interviews. ET: So you have Coachella coming up? First festival in the US besides SXSW? Lewis: First summer festival and in the US. ET: Coachella is a pretty big deal. Murray: There’s another in Alabama called Hangout Fest on the beach. ET: This is your first time in America too, right? What is your favorite thing about the US? Jordan: The people. Hands down. Everyone is so straight up and wants to talk to you. Even if you meet a rude person, they are still so friendly! Sam: There’s a weird attitude Brits have about Americans. Lewis: We went to I-HOP yesterday and everyone was like so lovely. ET: Try your best American accent. Murray: It was a huge guy too! ET: That accent was pretty good. Murray: Jordan’s really good at accents. ET: If you say “rise up lights” fast in an American accent, it sounds like “razor blades” in an Australian accent. Jordan: If you say “bay con”, it sounds like “bacon” in a Jamaican accent. Jordan: Last night, I had the most amount meat that I’ve ever had in three years. Jordan: Yeah. Apart from when we are in Texas. ET: Where do you see yourself going next? Ollie: Releasing music. We just take it as it comes. Lewis: We’re allowing things to fall into our laps. We’re not actively pursuing them. Sam: I mean a US tour would be amazing. Jordan: Just writing good, fresh music and getting it out to the world, enjoying it and meeting all of you. Listen to Easy Life’s Spaceship Mixtape here and keep up with the boys on Instagram and Twitter.